Creates one or many file elements within specified course, under specified parent folder element (if parent folder element is not specified root folder element is used). Uses inherited security from parent folder element. User specified in a content of the message is assigned as creator and owner of all created element. File element is a content placeholder for a course entity containing link to file, name, and comment. Message with that type will create file element(s) inside course. 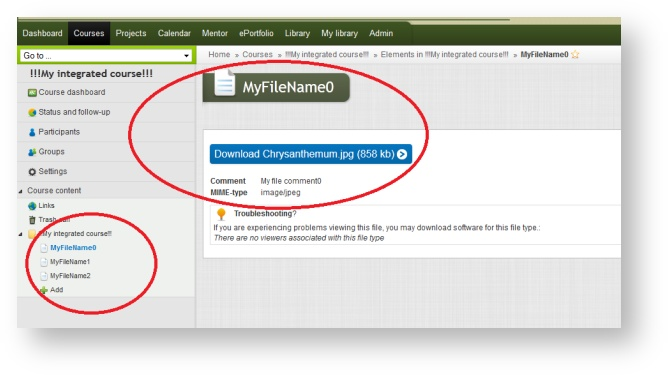 All elements will be added inside specified course and in one specific folder (course root folder or folder found using specified parent element id). Depending on Active parameter created elements should be active or inactive. Elements will be added by impersonation of the specified user. That user will become owner and creator of all created elements. All elements will inherit security settings from parent folder. Each element will have a name based on a name attribute specified on File element or file name referred in File element if name attribute is not specified. There is possibility to add comments to created elements through comment attribute on File element (it is optional). Array od SyncKey for the created content. Id of the course where the element is to be created.. User SyncKey of the creator. SyncKey of the folder where the element is to be created. If not specified then create in root.This is a SyncKey of a previously created folder int he course. Attribute. Reference to id in SyncKey element. Upload desire file using UploadFile service. Result of that message processing can be acquired using GetMessageResult method with message identifier as an input parameter. User must not be external. Check the flag (external_user_id and external_customer_id for user created AICC). User must not be deleted. Course must not be deleted. If specified: ParentSyncKey must be existing folder syncKey created using migration toolkit. If specified: ParentSyncKey must point to an element ID within the course. If specified: ParentSyncKey must point to a folder. If specified: ParentSyncKey must point to not deleted element. File referred in a message must have been uploaded by the same 3rd party as making the call.